Looking SW from demolition rubble mound at excavation S of cottage. A really good day. 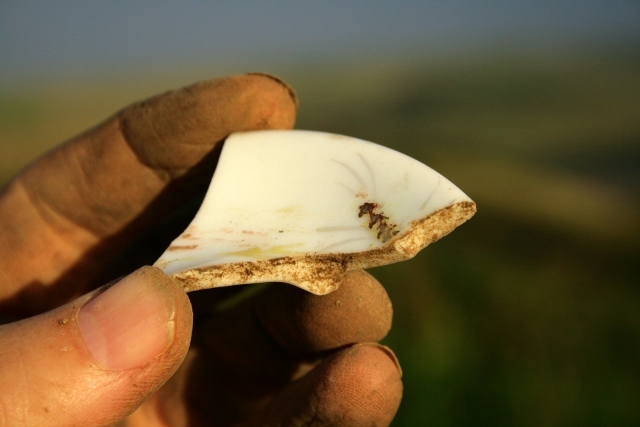 Lots of finds, a new feature, and positive feedback on a rehearsal for my guided tour next week. 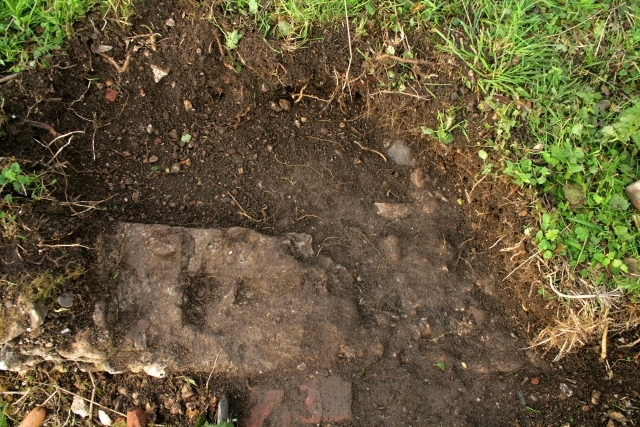 The brick foundation of the cottage’s internal wall was excavated along its complete length, and the division between the two main downstairs rooms can now be clearly seen. As expected, since the 1950’s bulldozer had removed all but a metre wide strip of the floor on the west side of the cottage, only a very few finds were uncovered; probably from the small amount of demolition rubble spillage from sweeps of the bulldozer blade and so may not be in-situ. Looking SE at excavation immediately S of cottage, E of ~1880 extension. 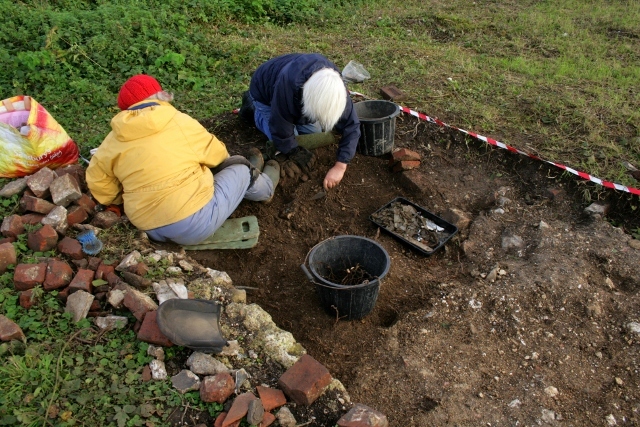 To the south of the cottage, and east of the approximamately 1880 ‘sort of lean-to conservatory’ extension, some very muddy demolition rubble was further excavated. 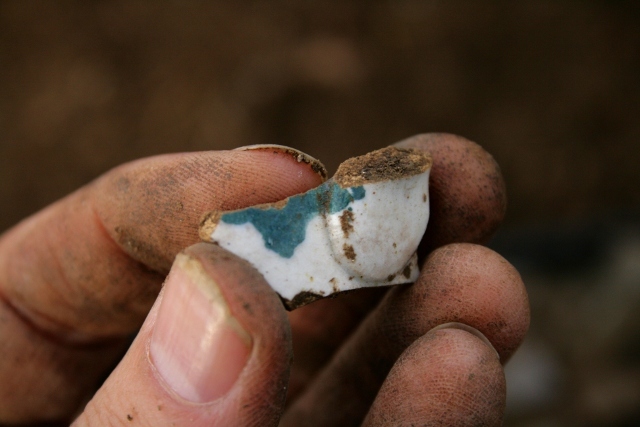 Cup handle shard from partially excavated grid square S of cottage, E of ~1880 extension. 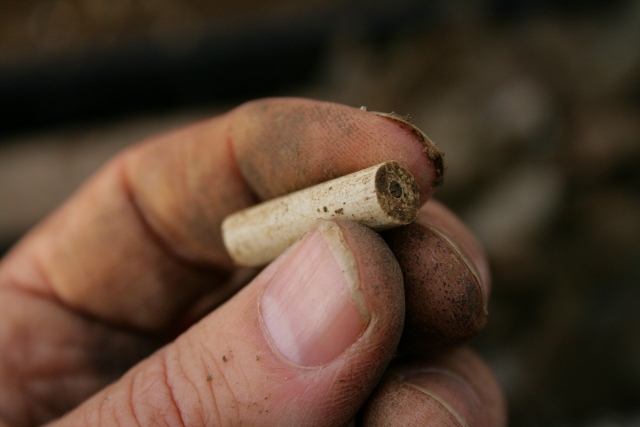 19thc clay pipe stem shard from partially excavated grid square S of cottage, E of ~1880 extension. 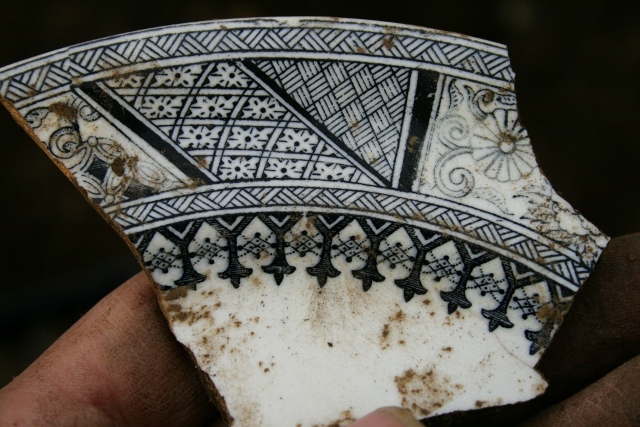 Decorated dinner plate shard from partially excavated grid square S of cottage, E of ~1880 extension. 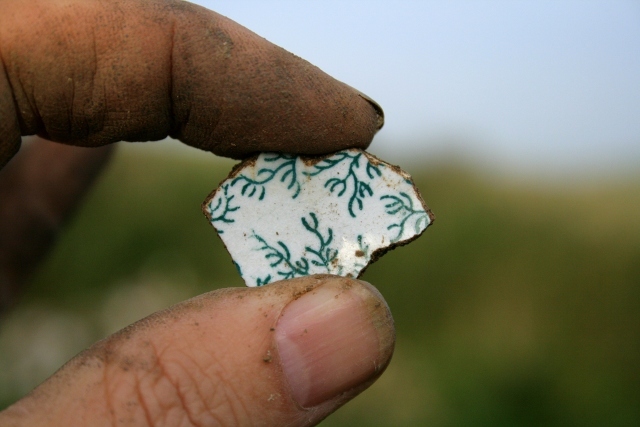 Decorated ceramic shard from partially excavated grid square S of cottage, E of ~1880 extension. The front garden gateway was opened up to its immediate north. It was hoped that beyond the garden wall both the modern and original ground surfaces would more or less coincide. 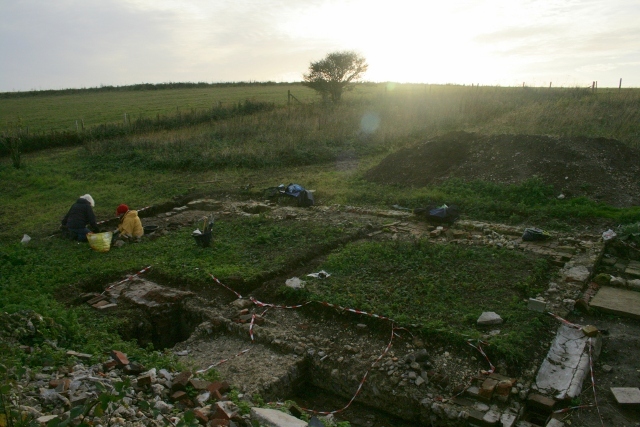 Thus a gentle slope down from the west, through the original gateway could be easily dug to enable next weekends’ visitors to enter through the original gateway to the site. However, I was surprised to discover a much deeper layer of demolition rubble beyond it than I had expected. Within the gateway there was little sign of the expected brick quoin to which the gate was presumed to have been attached. The western mortar edge of the wall sloped gently back and seemed relatively smooth, and contained the negative imprints of rounded flints. Thus the bulldozer cut through the wall here is not immediately apparent. The southern edge of its threshold appeared to be partially sealed under a shallow layer of compacted earth. This lensed out across the mortared flint threshold and was replaced by the relatively loose and well draining demolition fill. Immediately to the north some rounded flints, with the initial appearance of small cobbles, were observed at the same level as the threshold of the gateway, but they did not seem particularly well embedded. Evidence for a small fire was unearthed over its threshold, and the rusty nails and charcoal found there may have been of wood from the demolition of the house and its outbuildings. 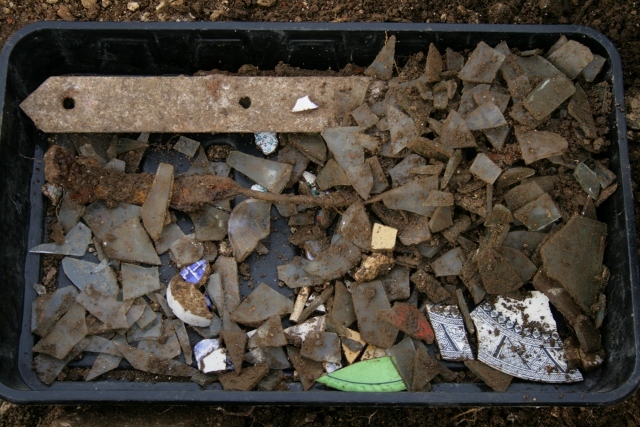 The demolition rubble also contained similar proportions of roofing slate, brick, flint and mortar rubble to those found right across the area in front of the cottage. 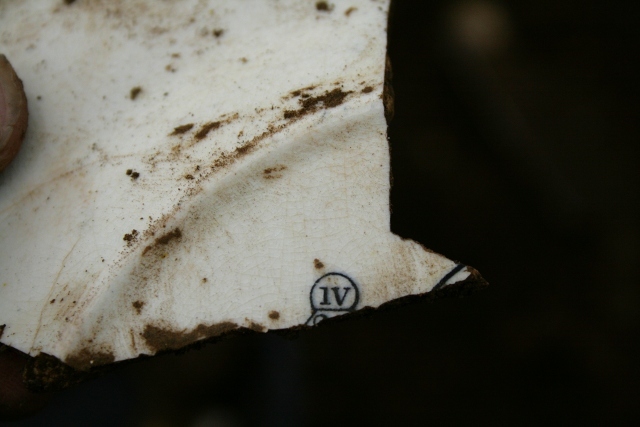 A very few small shards of ceramics and glass were found. The almost inevitable .303 cartridges were found in all three of the areas we dug.